UK, Cali & Guadeloupe: LIVE Aboard the JR! 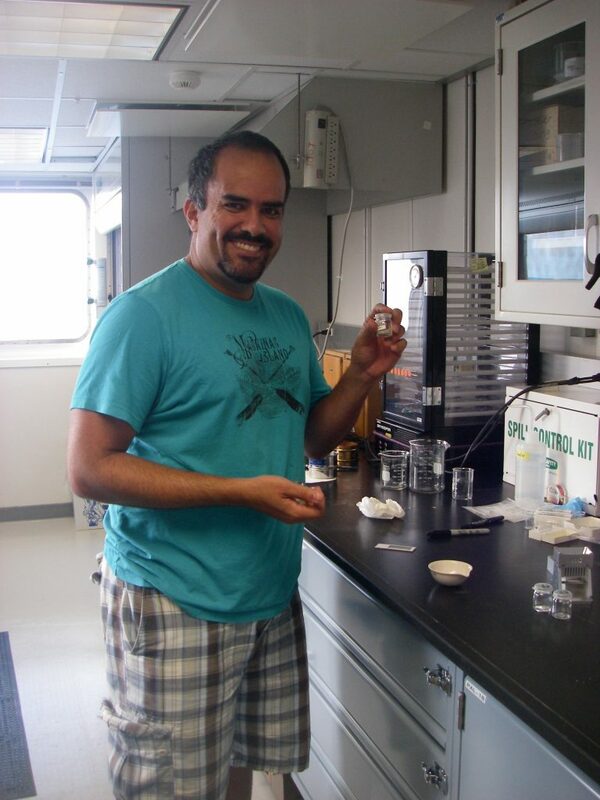 Today’s post is a PHOTO Story of one of four micropaleontologist aboard Expedition 340, Michael Martinez, who is completing his PhD at University of South Florida’s College of Marine Science. Michael has provided a series of photos and captions to share with us a glimpse of his research experiences thus far on the JR. Please send comments to let us know how you like this format for telling 340 scientists and technicians stories. Thank you, Michael for sharing your part of the geologic puzzle being assembled during Expedition 340. Enjoy! This is a photomosaic of the island of Montserrat in the Lesser Antilles. The big hill in the center background is the Soufriére Hills volcano. This is an active volcano and has undergone several eruptions since 1995. We are studying the volcanic sediments deposited below sea level to understand the evolution of this volcanic island. This picture was taken approximately 60 miles offshore. This picture shows a section of one of the cores drilled by the JOIDES Resolution drilling crew. What you see are hemipelagic sediments (light colors) interbedded or “mixed” with volcanic rich sediments (darker color). You will notice numerous bands of different colors made by marine organisms that live within the sediments (infaunal). This process is called bioturbation and it occurs after sediments are being deposited. These fossils are benthic Foraminifera. They are single celled protists that make a shell of calcite (calcium carbonate). You will see that each one is made out of several little spheres. These spheres are known as chambers and each one represents a different growth stage. The benthic foraminifer shown here is known as Siphonodosaria cooperensis. This species of benthic foraminifer became extinct approximately 0.58 MA or 580,000 years ago. We use foraminifers like this to give an age of the sediments in which they lived in. The scale at the bottom left is 1 mm. This is a photomosaic of the Sedimentology/Micropaleontology laboratory. Our lab is the best one in the ship because we got two windows!!!!!!!!! This laboratory has all the equipment, materials, and chemicals (Hydrochloric acid, Acetic acid, Sulfuric acid, acetone, etc.) needed for micropaleontologists, like me, to process our samples. On the left side you have two sinks, MilliQ water source, numerous drawers with materials and gadgets (like sieves, mortars, slides, etc.). This lab is equipped with two fume hoods, oven, centrifuge, hot plates, and humidifiers. When a sample is received from the core deck, the first step is to get in our lab and process the sample. It might take between 10 minutes to 2 hours to fully prepare a sample before looking at it under the microscope!!!! If sediments are very sandy it takes like 10 minutes. But, when we get clay rich sediments it takes a long time because typically most clay sediments tend to be very sticky (depending on composition). This is my working station. I got a corner desk so I have more space to redistribute my stuff. Here you can see a PC computer, my laptop, camera, cell phone, and headphones. Sometimes it gets very tedious to look for foraminifers under the microscope since it takes me like one hour to analyze a sample. To maximize my efforts and work faster, I brought with me several TV series like The big Bang Theory, The Simpsons, and the X-Files (behind my laptop) to keep me entertained while working. This benthic foraminifer is the MOST BEAUTIFUL one I have ever seen. I cannot imagine how these critters develop such morphologies. This foram is known as Laticarinina pauperta and is commonly found at depths close to or greater than 2000 meters below sea level. The scale base is 1 mm. This is really cool. The photo on the left (not to scale) is the Sputnik satellite. First object to orbit the Earth made by the Russians in the 1950’s. The photo on the right is an Oolina sp. benthic foraminifer. I am amazed by the resemblance between pictures!!!! The scale is 1 mm.